Foton fell behind early but regrouped by the second quarter and led the rest of the way to capture the FBA title. 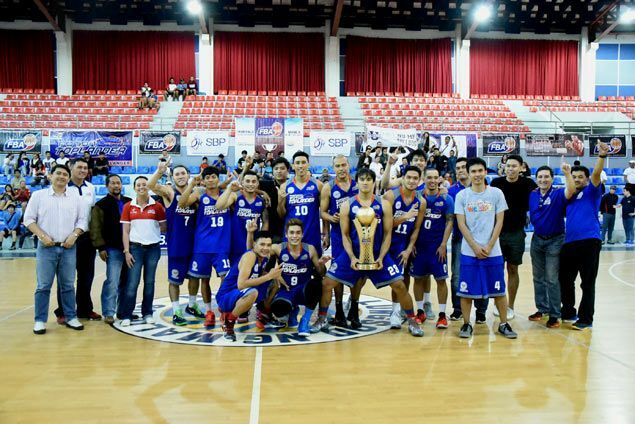 PAMPANGA Foton defeated Manila National University-MFT, 77-69, in the deciding Game Three on Tuesday night at the Malolos Sports and Convention Center to capture the Filsports Basketball Association (FBA) Second Conference title. Allan Mangahas led all scorers with 23 points while Jerick Nackpil added 17 off the bench to spark the Toplanders to a 2-1 title series victory over the Mica Tan-backed Bulldogs. Foton also got solid contributions from MVP Levi Hernandez, who scored all of his 15 points in the second half, and Marlon Gomez who finished with 10 points, 14 rebounds, and four assists. Mangahas and Nackpil combined for 11 points in the second quarter, leading the Toplanders to a 35-32 halftime lead from an 8-16 first quarter deficit. After being held scoreless in the first half, Hernandez provided some much-needed scoring for Pampanga Foton to keep the Bulldogs at bay the rest of the way. Issa Gaye had 17 points and 15 rebounds for the Bulldogs, who forced a do-or-die match for the FBA title after a 111-109 double overtime win in Game Two. Pampanga Foton, which took Game One, 76-69, became the league’s second champion after Quezon City-University of the Philippines ruled the inaugural conference of the regional amateur grassroots tournament last summer.